North Hastings Community Trust, with our friends and supporters are committed to sustainable solutions to the impacts of poverty. This means when needed, we advocate for systemic changes, as we seek to address the root causes of poverty. At times it can feel overwhelming as we pick up the pieces of systems not working - hence we call on the Gnomes! Please see Report - Public Good Initiative - Building Advocacy Strategies: Formal and Informal Challenges to Advocacy, and Promising Ways Forward for detailed information on legal and policy parameters which have guided and constrained advocacy effects within the context of charitable organizations. The Canada Revenue Agency set a 10% limit on the portion of resources that a charity may devote to ancillary political activities. But on July 16, an Ontario Court quashed this rule, saying it violates freedom of expression. This means there is currently no limit on the amount of non-partisan political advocacy a registered charity can do. We do not know yet whether the government will appeal the ruling. Given the uncertainty around the recent changes, NHCT commits 10% of our work to advocacy. Many of us volunteer additional hours when required on particular initiatives. 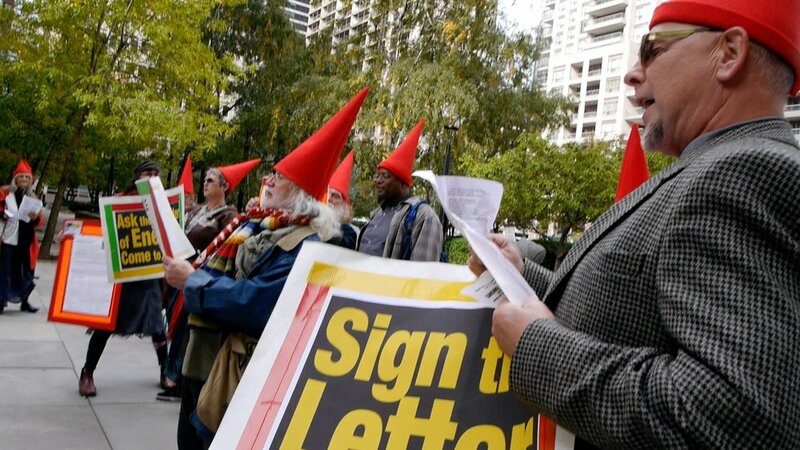 The Gnomes for Social Justice and Equity (in photos) were born out of our Community Garden movement in response to escalating hydro costs. The Gnomes bring us great joy in times of strife! Hydro is an example of one of our advocacy efforts, as we heard daily of people struggling to pay their hydro bills and feed themselves and their families. This is a major concern to the people of North Hastings and indeed many others in Ontario. 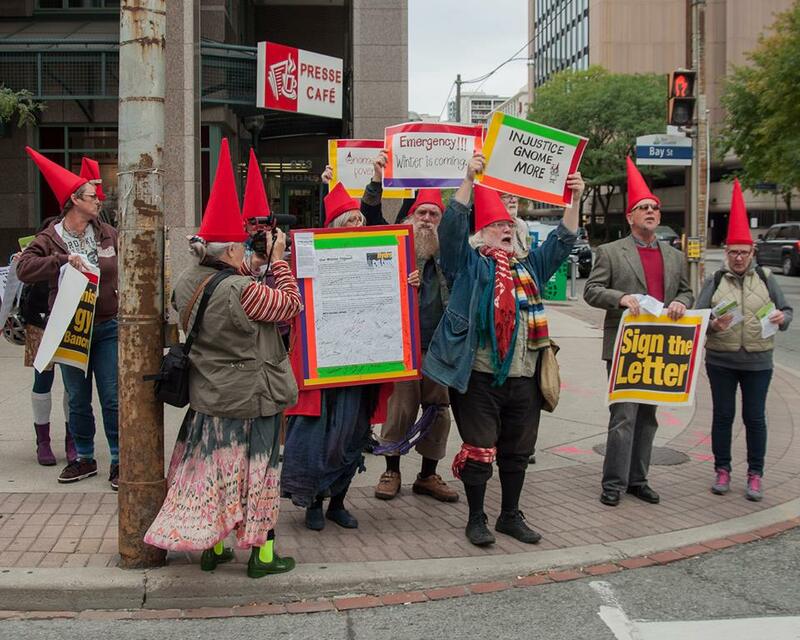 We were heard along with other Ontario residents demanding fair hydro policies and practices. A small win! As hydro one began to adjust some of their practices. In the late fall of 2016 Hydro One called NHCT with a commitment to re-connect power to everyone disconnected. We know this is currently working for some and not others. We will continue to address these issues as we know we need a larger commitment to fair rural energy solutions. Water has become a big issue for Bancroft residents as the Town feels forced to raise its rates for water and sewage by 58%. We know this has the potential to devastate our town as residents, businesses and agencies cannot afford this increase. Currently we are working with residents, businesses and community agencies to collectively solve this problem and save our Town. Town Hall Water Report. (This file is a pdf, and will open in a new window.) Also see the Kitchen Councilor Video which documents community members trying to speak to our Town - https://vimeo.com/251001004. Social Assistance Rates – NHCT witnesses first-hand the effects of not having enough to meet basic needs on gov’t assistance (Ontario Works and Ontario Disability Support Program). Indeed, much research has been done to show that people on government social assistance are living on incomes 60% below the poverty line (Canadian Centre for Policy Alternatives). Together we can make change! Join our efforts to create a community free of poverty and injustice.